Imagine the most important day of your life…your family, your friends, your wedding in the Riviera Maya, Mexico…paradise. Hacienda Tres Rios will make all of your destination wedding dreams come true. Our basic wedding package includes a officiant for the ceremony, the bride’s bouquet and the groom’s boutonnière, a gazebo and chairs for guests, a centerpiece for the wedding table, music, a microphone and speakers for the ceremony, a champagne toast and the wedding cake. Couples also receive an upgrade to a Casa Grande One-Bedroom Suite. Most couples choose to add special touches to their theme, ceremony and of course many hold a spectacular reception. 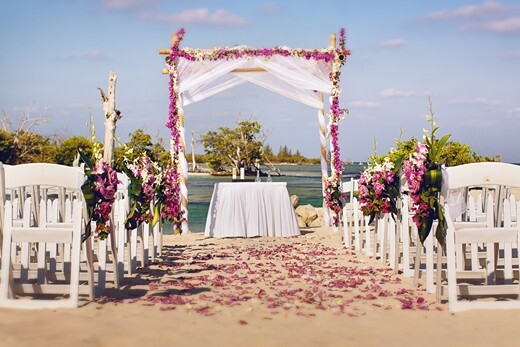 Venues include the beach, the nature park or one of our event salons. Our Ya’ax Che Spa salon offers full hair and makeup services for brides, the bridal party and even wedding guests. Hacienda Tres Rios also offers honeymoon and vow renewal packages and Mayan-themed weddings.